In an unsuccessful effort to move to the center Obama has fired Van Jones, his green jobs czar. When this video about Jones’ background went viral the administration started to worry. Jones was co-founder of STORM, a pro-Communist group. Then the Ella Baker Center. Then he was part of the Apollo Alliance (authors of the stimulus package). Some of the advertisers caved, but others did not. Once again, the race card is played and the ensuing strip poker game reveals some very radical statements coming from a White House advisor. Gee, can you find that kind of rhetoric in the archives of Colin Powell or Michael Steele? Well, no you can’t, but they continue to claim that the criticism is about race, not fundamental ideology. 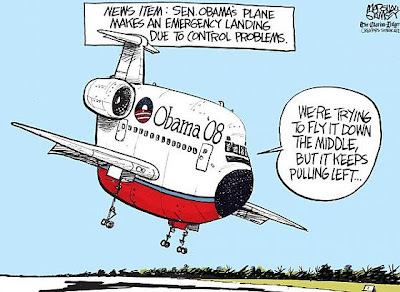 Next come the poll numbers and a very critical problem is revealed. The White House is losing the support of the moderates. According to a CNN Commentary on August 27th: “In May, 66 percent of independents approved of Obama's job performance, according to the Gallup Poll. By August, Gallup showed the president was supported by 49 percent of independents." Democrats may own the black vote. They may even own the Latino vote. But when you get beyond identity politics you have to really work to win the Independent voters. And they are losing confidence in Obama and his staff. So Jones rolls over, claiming that he resigned for the good of the order. He called the attack a “vicious smear campaign” but failed to elaborate. In fact, the White House didn’t ever really defend him, leaving the media to take their quotes from George Soros as the apologist for Van’s radical past. As Obama attempts to move toward the middle he is confronted once again with his extreme left past. As an important byproduct of this OTJ lesson Obama will now create his own kinder, gentler proposal for national health care. But as the politicians say, standing in the middle of the road is the most dangerous place to be. Suddenly, an old campaign cartoon seems appropriate.